Experts in temporary staffing and contract resourcing, we’re the perfect partner to match the best people for the job. We help you in building the leadership team. We can take care of your compliance needs completely while you are busy taking care of your other business needs. ERP Corporation is India’s one of the first Gen-next and Technology enabled HR Outsourcing Companies. Headquarteredat Mumbai, we provide world class HR services. We believe that ERP Corporation is India’s one of the first Gen-next and Technology enabled HR Outsourcing Company. We assure you that at ERP our clients can expect the “Best in Time?? solutions/ procedures in the service. The In-house CRM System on our cloud base server helps us to store our data and manage Attendance & Payroll Management System for our clients. Toll Free No. For Clients -1800270555. Faster query resolution involving Multiple SPOC and Region. Mitigating single person dependency. Hotline for Associates-86-91-848586. A Dedicated line for faster query resolution of all the associates. Single window solutions. Conference Call Bridge Involving multiple key stakeholders for quality through put and better output. Call back facility within 1 hour. 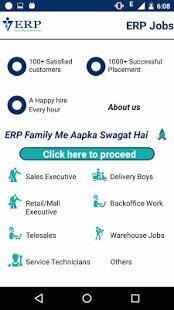 ERP Jobs Mobile App The entirely new ERP Jobs Mobile App is now available for download on Google Play. The app is free for all users, but will require a membership with us. Create a profile and search a suitable job for you. Get interview calls on applying to a job with us. 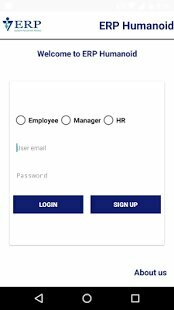 This application lets employees of an organization to track their attendance and leaves.